NPR's Bees (Moderate, Middle Of The Road Bees) Up And Left Swarming bees at NPR headquarters led to a warning to not use one of the building's entrances. You know how that advice went over with a bunch of journalists. 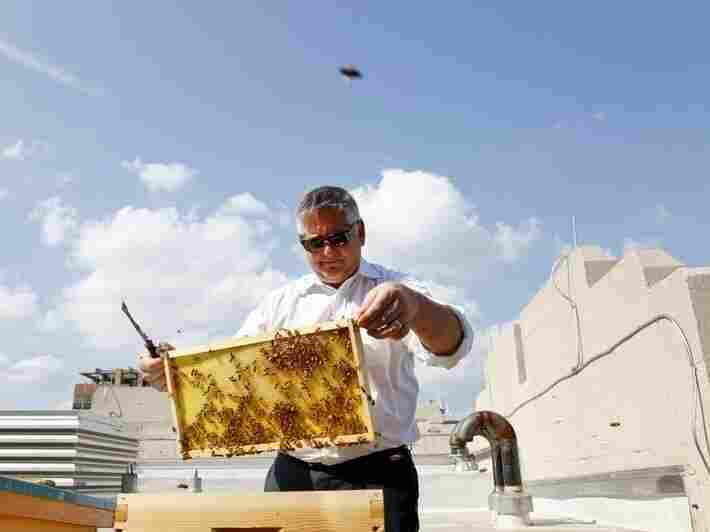 Beekeeper Jeff Miller checks the hives on NPR's green roof in 2013. A swarm of potential stingers were unleashed on Washington, D.C. this week. This is not a political statement. A swarm of bees from one of the two hives atop NPR headquarters buzzed over the streets as they followed their queen out of their hive to some new location, which is unknown at this time. Queen bees apparently get restless and strike out on their own, like teenagers, followed by a swarm. Jonathan Durant, the building's director of facilities management, alerted NPR staff not to leave the building on the side of the street where the bees flapped and droned. So of course, a small swarm of reporters, editors and producers rushed out into that street to look for the bees. People don't get into the news business to avoid getting stung. No bee stings were reported. This will no doubt discourage some of NPR's critics, and even some people in the building. The hives were installed when NPR moved into our rehabbed headquarters building in 2013, as part of a "green roof" that is home to a large variety of plants. The foliage helps cool the building and protect the roof. The bees help nurture plants and trees all over this downtown neighborhood by pollinating. The hives are officially named the Halter-Plews Bee Hives, to honor the parents of two NPR supporters. But the hives are more colloquially called Swarming Edition and All Stings Considered. The bees produce a small amount of honey every year, which the beekeepers get to keep as part of their inspection and maintenance service. There have been plans to eventually sell a little of the honey in the NPR gift shop. If this plan ever develops, I propose they call the NPR honey Sweetened Edition. "The bees are bringing in pollen. ... On a scale from one to ten, ten being very strong the overall strength of the colony is 5. On a scale of one to ten, one being very gentle the hive temperament is 5." Let me interject here: how fitting that NPR bees are so moderate and centrist. Beekeeper Sean says that although the queen has departed, a new one awaits. "There are queen cells with egg, larva or pupa in the hive," he reports. "One of the hives swarmed, however, the colony looks like it will recover quickly. Eggs are not present in the hive but there is brood. The brood pattern is beautiful (solid & uniform)." In a city that can swell with self-importance, at least a few citizens fly above it all.